A gallery of gorgeous new images shows a cone-shaped space capsule shooting like a meteor through the atmosphere of Mars, and descending quickly toward the surface before its thrusters set it down gently in the middle of a rocky, uninhabited landscape. The human crew prepares to set food on the Red Planet. The images are only artist's renderings, of course — humans have not yet made it to Mars. The gorgeous gallery was released on the Flickr page of the private Spaceflight company SpaceX, and shows what it might look like if and when the company's Dragon crew capsule makes a trip to the Red Planet. You can see all of the new images in our full Crew Dragon photo gallery. From early in its creation, SpaceX has made clear that one of its central goals is to set up human colonies on Mars. Test flights have already begun on the Dragon capsule, so it's possible that the gorgeous scenes captured in this stunning and incredibly realistic image series could already be on the horizon. The new SpaceX images on Flickr show the dry, rocky Martian landscape as it often looks in images captured by NASA's Curiosity rover and other robots on the surface of the Red Planet. 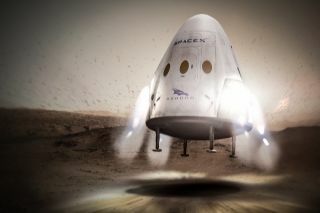 NASA scientists have studied the possibility of using a robotic version of its Dragon capsule in a mission to bring samples of Martian soil and rock back to Earth. The "Red Dragon" project, which is only in the concept stage, would pick up samples collected by NASA's 2020 Mars rover. This could help tremendously in the search for ancient life on Mars. Finding signs of ancient organisms in the Martian soil will likely be an extremely delicate task and will require that the samples be analyzed in advanced laboratories on Earth. Part of SpaceX's plan for human spaceflight involves making its powerful Falcon 9 rockets reusable. In theory, the rocket's first-stage boosters would shoot the payload into space and then land safely on a ship, rather than falling into the ocean and being discarded. The company has attempted to land the reusable stage of the Falcon rocket on two occasions, without success. NASA, meanwhile, has also discussed a human mission to Mars but has not made any solid mission plans. However, the space agency has said that the primary goal of the one-year mission aboard the International Space Station is to learn about how long-duration spaceflight affects the human body. NASA astronaut Scott Kelly and cosmonaut Mikhail Kornienko, are halfway through their nearly yearlong stay aboard the station. Using current technology, experts estimate that a trip to Mars would require more than a year in travel each way..